StickBo, a cute play on Rambo's name, allows you to become a stick figure Rambo, who in a side scrolling shoot-a-thon destroys all that oppose him. As you destroy wave after wave of enemies, you gain new weapons. 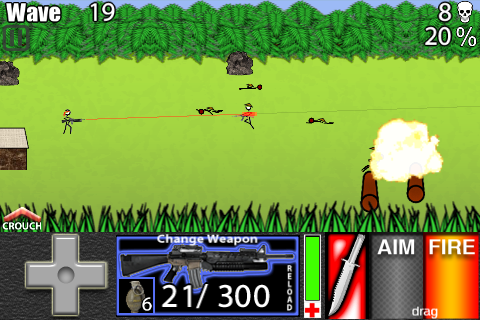 Unfortunately, there are only 21 “waves” and select amounts of weapons but it is definitely addicting. I started the game with trepidation, thinking of it as a waste of time, but I was mistaken. As I began my perilous journey from left to right, it became apparent that StickBo was God, or at least God in an action movie. Now I say this only because you can stand in front of enemy gunfire and take virtually no damage. Then, when you complete a wave, you get full health! I feel like if you died in this game it means one of two things: one, you left the room, or two, you got into a ninja fight involving a donkey and a turtle. Except for the not so great user interface, this one is a winner. I’ll give it 212 lumps of coal. Kinetic Balls. Not a game. Not sure if I should say it again…it is NOT a game. It is however part of the games category in iTunes App Store, and has been on the top 10 free apps for some time. WHY?! Now yes, I am a bit of a media/game/entertainment junkie. It’s why I have the phone…along with several other amazing things that this God-sent phone has at it’s disposal. But, how do people keep giving it good reviews, saying it’s “fun,” when clearly it is not. Here is what Kinetic Balls is: Five balls hanging via wire that if you move one of the balls a certain distance, it will hit the others and cause an equal reaction onto the other side. These balls are also known as “Newton’s Cradle”. While it is a neat thing to see in real life, there really is no need for a digital version. Don't people have better things to do then turn on their phones to watch balls go back and forth? iTunes customer ..........'-'.......... writes, "Keeps me entertained :]". I don't understand. Download it, I DARE YOU. I give this one 28 out of a 100 swinging balls. 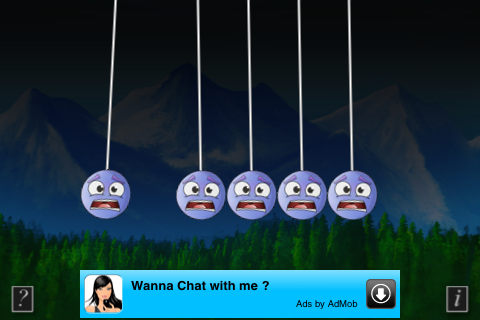 Falling Balls is a super basic FREE game app from developers WickedPissahGames and Bit-101. Now what do I mean by “super basic”? 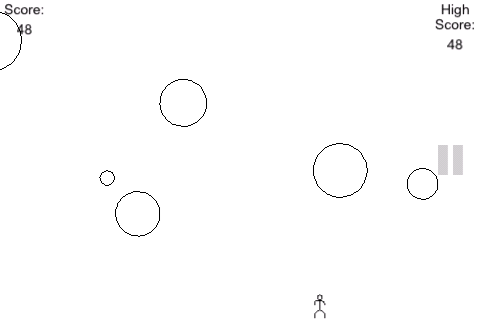 The game starts with you as the stick figure hero, with the unenviable task of dodging falling balls. At first I thought, “Hey, this is pretty easy, I tilt left – dude goes left; I tilt right, dude goes right.” Mere seconds go by when suddenly balls fall off the top left corner! I screeched with surprise as I was nearly squished. More time went by and more and more balls were dropped. It became apparent that I did not have the skill to continue at this pace, so the game decided it was time that my fate would be death. A ball bounced off the little stick figure creating a splat of blood, and an extremely annoying scream. High score…19. Throughout the next hour I continued to play, getting higher and higher scores until I eventually hit the amazing score of….50. The scream of the dead stick man eventually got to me and I was done. I can still here the screams of those little guys, they haunt my dreams. Like Advanced Wars, but on the iPhone. If you like turn based strategy, you should really look at picking this one up. It's straight up turn based strategy goodness. You're a sheriff in the wild west taking down bandits, "tapping" your resolve to take down the bad. Wyatt Earp meets Wac-a-mole!